Pea Protein, Soluble Vegetable Fiber, Almond Butter, Sugar, Almonds, Tapioca Syrup, Cashews, Dates, Water, Dried Cherries, Natural Flavors, Dried Cranberries, Rice Starch, Cashew Butter, Sunflower Lecithin, Puffed Amaranth, Quinoa Flakes, Sea Salt, Chia Seeds, Flaxseeds, Malic Acid, Sunflower Oil. Our journey began in the mountains of Colorado, where the air is thinner, the people are fewer, and everything feels a little simpler. It's where less is more isn't just a gimmick, it's a way of living. It's from this back-to-basics, environmentally conscious mentality that the EVOLVE Brand was born. 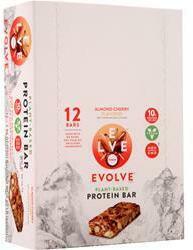 Here at CytoSport Inc., makers of MUSCLE MILK Products, the EVOLVE Brand was built to provide a clean protein source to fit your active, on-the-go lifestyle, and to make trying the plant life, simple. Processed on equipment that also processes Tree Nuts, Milk, Soy, Egg, Wheat.